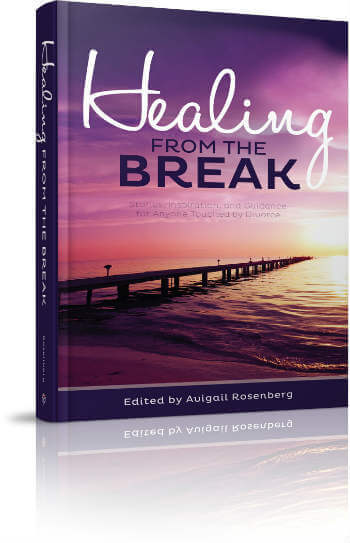 Healing from the Break by Abigail Rosenberg (not her real name) is recommended reading for anyone who goes through a divorce, Jewish or not. Though many of the references are “Jewish”, the themes are universal. The book is large on feelings the emotions and pain of men, women, and children who tell their stories. Arranged in chronological order of a typical person’s progression, the book opens with stories of raw emotional pain at the separation followed by divorce proceedings to learning to live on your own again, dealing with children, dating again, remarrying, and fitting together blended families. The stories have to be read with a bit of skepticism as they are told from the point of view of the story teller (who almost always views him or herself as ‘in the right’ while their spouse was almost always the crazy one). In fact, I recognized one of the stories, and it was clearly embellished either to make for a better story or to make the storyteller feel better, but nevertheless, the emotions are real. The topic is not one often talked about or written about in a meaningful way . . . or maybe I’ve just never looked, but I now recommend this book to anyone going through, or about to go through, a divorce. Thankfully, that hasn’t been too many people but to understand the pain of going through it and the hardship of rebuilding your life anew should help people realize what they have. Trying to rebuild an put behind past trauma, especially with children involved, creates all sorts of problems. Or, to the contrary, it should help people realize they’re not alone and certain things aren’t normal or acceptable. The book takes first hand accounts from a variety of people, especially including both men (whose voices are often absent when discussing such topics) and women, during all different stages of the “process” and finding, in most cases, a meaningful or, at least, better conclusion than the start. Unfortunately, the topic of divorce is so prevalent today that a good book like this is needed and can save one from going it alone or going to, I don’t know, a support group where one can’t turn the page.